Last visit of the year from the “Good Wood” Team. This group have become regular users of the garden. The team enjoy the garden and feel they are able to make a positive contribution. We spent the day clearing up leaves, a seasonal job that we all enjoyed and with their help we were able to make a serious impression on the deluge. This week also saw the arrival of the spring bulb order … 4000 bulbs! A mixture of Narcissus, Alliums, Dwarf Iris and Crocus to be planted in the Scree, Peat Beds, Tower Border and down the banking towards the Tower. Planting bulbs along with clearing leaves and collecting Moss and green material for the Wreath making Workshops will be the main jobs for the next week or two. Wreath making Workshops went off very well. I always get so very anxious about this event … will we have enough moss, string, wire etc? 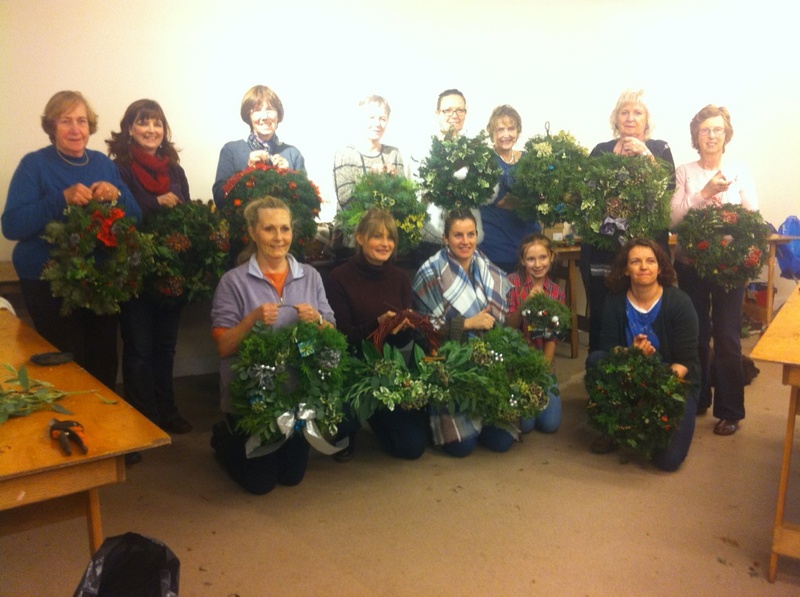 The following week 5 Volunteers made wreaths and I got Dr. Jack a Christmas Tree for Duddingston Kirk. We also gained a new Volunteer called Jack. A lovely young man who is in the middle of his Doctorate … but needs some time outdoors. On this subject, our lovely Volunteer Lizzie has now qualified and is very busy working as a 1st Year Doctor, on rotation through hospital departments throughout Edinburgh and the Lothians. Lizzie pops in for some fresh air and gardening whenever she gets the chance. Because the weather was still so mild, and as a change to lifting the still falling leaves, we got on with the cutting back this week … seems a very odd thing to do just before Christmas but it’s nice to see some clarity in the garden. David and Jack cleared the stem of the large golden Lawsons behind the Golden Border….that changed the view….amazing. I cannot wait for summer, we will be able to see the border from all sides now. Suddenly there are Aconites coming up through the soil! And the Hellebores have buds, Iris Unguicularis has its first flower, the Winter Cherry is beginning to flower and the Viburnum Bodnantense is now really flowering at full tilt. It’s in these dark midwinter days that any scent or colour is the most cheering. Was in fact the day of ‘Storm Frank’! I spent the day raking up debris, but had the joy of a ‘will o the wisp’ dancing in a puddle beside the corner of the Tower. Never seen anything like it before and I was enchanted. Still clearing up in the garden … planting donated shrubs. George our lovely Canadian Volunteer who left to go to a full time gardening post in Perthshire came in for a visit this week. Lovely to see him and to hear that he is getting on. We also had a new volunteer, Lorna begin with us. Lorna used to volunteer with me when I worked up in the Community Vegetable Garden, so it is lovely to catch up with her again. Another new Volunteer, Michael started with us this week. He is a young American undergraduate studying at Edinburgh University. He came along after looking up “things to do” on Trip Advisor. Seemingly we have ‘outstanding reviews’ on Trip Advisor … It may explain why we have so many foreign visitors, from all over the world. An unbelievably cold and frosty day, the ground was frozen solid. At last winter temperatures make their entrance. It was so cold I was wondering what I could possibly do with 6 volunteers … it was a perfect day for a bonfire!